When you are in the market for a new subcompact car that has an abundance of smart features, you need to get inside the new Ford Fiesta and see them in action. The trouble with having a manual transmission is shifting gears when going up a hill. This is no longer an issue in the new Ford Fiesta thanks to the standard Hill Start Assist feature. This feature is activated when shifting on a hill and holds the car brakes a few seconds to ensure the car does not roll back. Place your new Ford Fiesta in reverse, then you activate the standard Rear View camera. Watch as the screen on the center stack turns into a camera if you place the shifter in reverse, allowing you to clearly see everything that is behind your car before moving. 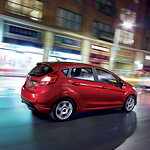 Stop by Ray Price Ford to take the new Ford Fiesta on a test drive.